One can see pretty much anything one wants in the 2012 defense budget China announced last weekend, and which the National People’s Congress (NPC) will approve this week: more military build-up from an increasingly assertive regional power; catch-up spending for a developing nation’s armed forces still in need of substantial modernization; even a proxy for the expected slowdown in the economy overall. It is arguably all those things, but most of all it is pretty much more of the same. China has had double-digit increases in its official defense budget every year since 1989, with the exception of 2009’s 7.5%. Ahead of the NPC’s opening, spokesman, Li Zhaoxing announced that defense spending in 2012 would be 670.2 billion yuan ($110 billion), a rise of 11.2% on 2011’s figure. It is the first time the budget has topped $100m, if that arbitrary threshold matters to you. The proposed increase for this year is smaller than last year’s 12.7% rise, reflecting, as promised under the current five-year plan, the slowdown in the overall economy. This year, for the first time, China says, it is including weapons R&D and acquisition in its numbers, which have in the past been overwhelmingly for personnel pay, maintenance and equipment. Quite what difference this makes to the headline number is unclear. How big a bite, for example, is the new aircraft carrier, or China’s new anti-ship missiles and J-10B jet fighters taking out of the official defense budget, if, indeed, that is where they are being accounted? As is well accepted, the official defense budget is reckoned to account for less than two-thirds of China’s total military spending. The People’s Armed Police has its own budget, as does the militia. Some, if not all, of both budgets can reasonably be considered military spending. But more opaque is the question of how much is being spent under the aegis of the space program and the development of the strategically important “national champion” industries on R&D that has dual military-civilian use, or in the space program’s case, pure military use. Not only does China still spend less than a third as much on defense as the world’s largest military power, the U.S. (however you add up the figures), much of the operational deployment of China’s new military toys is still years away. Nor are its aircraft, missiles and ships yet comparable in the aggregate with those in the most advanced fighting forces, despite the ambitious development of a huge domestic aerospace and defense contracting industry. Pravda reports from Russia that China is trying to buy 48 of Russia’s new Su-35 fighter jets. The $4 billion deal is being held up Moscow’s concerns that their advanced frontline fighter will be cloned by the Chinese military, as happened with its Su-27 (the inspiration for China’s J-10) and the Su-30 (the J-11). If this deal comes off, it would be the first time that Beijing has bought foreign fighters for the PLA Air Force in more than a decade. What is unclear is whether this is an attempt to leap-frog to the future or a deal that is necessary because domestic development is falling behind. Aircraft engines and radar systems, we are told, are the critical areas where progress is not as rapid as hoped. That may be one reason that President assumptive Xi Jinping reportedly rebuffed U.S. President Barack Obama’s suggestion during his recent visit to Washington that the two countries’ military hold regular talks, as their economic and security officials do. A peep behind the curtain may reveal a less than flattering picture for the world’s second most expensive military force. Xi, who has close ties with the army–his father was one of Mao’s revolutionary generals before falling from grace–will not want to embarrass the PLA, and especially not while he is assuming the reins of power. And just as he will want to keep his military onside during the transition, he will want to keep America’s off-balance and guessing to the extent he can. There is no doubt that Beijing will continue to build-up its military forces, particularly the navy, which is developing submarine and carrier fleets to the extent it can be a power in regional waters, the logistics capability of the national command and support infrastructure, and the capacity to fight in space and cyberspace. It wants a modern, self-sufficient fighting force by the early 2020s. The 2012 military budget just keeps it marching in that direction. Beijing does not come away badly from Washington’s sale of $5.3 billion-worth of arms to Taipei. Washington backed off including in the deal 66 new F16 C/D fighter jets that Taipei wanted. Taiwan will only get upgrades to its aging F16 A/B fleet, but not the 66 new F16 C/Ds it had requested. That was the price the Obama administration had to pay for keeping relations with Beijing on an even keel. Given the PLA’s modernization, Beijing will be just fine with that. Nor will it be too concerned about the rest of the deal, which includes air-to-air missiles, guided bombs, radar and training. For all its bluster, Beijing never really thought it could scupper the whole deal. Keeping the military technology gap between the PLA and Taiwan’s armed forces as wide as possible was always its realistic goal in this case. Tick the achieved box. Similarly, possible retaliation, such as suspending military exchanges, as happened in January 2010 after Washington authorized the sale of $6.4 billion-worth of arms to Taiwan, will be hollow threats as doing so would remove the incentive for Washington to show restraint in future sales. Over the past decade, China’s military has benefitted from robust investment in modern hardware and technology. Many modern systems have reached maturity and others will become operational in the next few years. Following this period of ambitious acquisition, the decade from 2011 through 2020 will prove critical to the PLA as it attempts to integrate many new and complex platforms, and to adopt modern operational concepts, including joint operations and network-centric warfare. Beijing set the PLA an objective of turning itself into a modern, regionally focused military by 2020. As the Pentagon’s report notes, it is pretty much on track. This year has seen two high profile milestones passed, the unveiling of a stealth aircraft, the J-20, in January and the sea trials of China’s first aircraft carrier earlier this month. But the Pentagon believes it will be the end of this decade before China is able to project even a modest scale of long-distance force, which it defines as several battalions of ground forces or a naval battle group of up to a dozen ships, in even low-intensity operations. This evolution will lay the foundation for a force able to accomplish a broader set of regional and global objectives. However, it is unlikely that China will be able to project and sustain large forces in high-intensity combat operations far from China prior to 2020. The key question is how effectively the PLA will meld its emerging platforms and capabilities, such as its growing number of ballistic missiles, into an effective fighting force. This will take time. Training and integration are a crucial task for the PLA high command in the coming years. It may be getting new toys, but its human capital is only now being upgraded. The PLA is poor at inter-service command cooperation and lacks experience in both joint exercises and operations, one reason that China is becoming more engaged in international humanitarian, disaster-relief and anti-piracy missions as well as undertaking more bi- and multilateral joint military exercises. Recent reshuffles of the PLA’s top brass and new appointments are bringing about generational change among the military leadership, raising professional standards and accelerating the modernization of its command-and-control structures. The Central Military Commission named six new full generals and 20 new lieutenant-generals in July; all of the latter group are members of the so-called fifth-generation leadership. This generational change is also, incidentally, increasing the predominance of princelings, the offspring of the first generation of Mao’s revolutionary leaders and generals. That may mean the PLA gets even stronger support from civilian leaders (and vice versa as President assumptive Xi Jinping is himself a princeling); princelings are now the largest bloc within the military leadership. The CMC itself is likely to have a radical overhaul next year when many of its senior officers will have reached the age limit at which they have to stand down. The incoming leadership will be the most competent, best educated and professional the PLA has ever had, as well as being largely formed as individuals and officers in a China that has only been in the ascendant. Taiwan contingency planning has largely dominated the PLA’s agenda throughout its modernization. Many of the PLA’s most advanced systems are based in its military regions opposite the island. Although the PLA is contending with a growing array of missions, Taiwan remains its main strategic direction…The PLA seeks the capability to deter Taiwan independence and influence Taiwan to settle the dispute on Beijing’s terms. In pursuit of this objective, Beijing is developing capabilities intended to deter, delay, or deny possible U.S. support for the island in the event of conflict. The balance of cross-Strait military forces and capabilities continues to shift in the mainland’s favor. China’s ability to sustain military power at a distance remains limited, if expanding, primarily through the PLA-Navy. A section of the report dealing with energy and security underlines the importance to China’s energy supply of securing sea lanes. PLA theorists have coined the term “integrated network electronic warfare (wangdian yitizhan 网电体战)’ to describe the use of electronic warfare, computer network operations, and kinetic strikes to disrupt battlefield information systems that support an adversary’s warfighting and power projection capabilities. PLA writings identify integrated network electronic warfare as one of the basic forms of integrated joint operations,” suggesting the centrality of seizing and dominating the electromagnetic spectrum in PLA campaign theory. As a footnote, this Bystander’s eye was caught by this sentence in the report, “For over a decade PRC leaders have identified the so called ‘China threat theory’ as a serious hazard to the country’s international standing and reputation.” True to form and theory, Beijing has denounced it. “The report does not hold water as it severely distorted the facts,” said defense ministry spokesman Yang Yujun. Sea trials of the former half-finished Soviet-era aircraft carrier, the Varyag, that China has been fitting out at Dalian, seen above, were meant to have started on July 1st. Now local press reports are saying that the trials will get underway this month (here via Caijing, which puts the start date as soon as August 6th, though we think they’ll wait for the weather to improve). Workers have been seen readying the vessel to sail and uniformed PLA-Navy sailors parading on the vessel’s deck (Xinhua picture here). The carrier has previously sailed under it’s own power, as this footage shows, but the sea trials will provide a full test of its systems, which are Chinese developed. Li, from northeast China’s Jilin Province, was a member of the country’s first warship academy class in 1987 mainly for aircraft carrier commanders and among the country’s first group of commanders who could both pilot aircraft and sail warships. Li, 50, is a PLA high-flyer, in all senses. He joined the PLA Air Force in 1979 and was one of the top pilots graduating from the naval pilot captain’s course at Guangzhou Warship Academy in 1987. After getting his first naval command, the frigate Jiangmen, in 1995, Li was sent to the Kuznetsov Naval Academy in Russia (coincidentally the Varyag is a Kuznetsov class carrier) whence he graduated with a master’s degree in 1999. He then took command of a destroyer, the Shenzhen, before becoming group captain of several destroyers in the PLA-Navy’s South China Fleet in 2004. In 2007, he was promoted to chief of staff of the fleet’s destroyer task force. Li was posted to Dalian in December 2010. His extensive experience of the disputed South China Sea suggests that is where his new command will be spending a lot of time. In 2002, Li studied another decommissioned Soviet carrier that had been sold to China, the Minsk, that was being used as the centerpiece of a military theme park in Shenzhen (see the footnote to this piece). He told a Hong Kong newspaper at the time that China would build its own carriers. More likely evidence of long-term planning than a luck guess. There are pictures of the Varyag here. And a pictorial timeline of the ship’s outfitting here. But they give no hint of what it will be renamed. Nor has there been any official word. Our widow’s mite would be on one of China’s four municipalities–Beijing, Shanghai, Chongqing and Tianjin–being honoured, if on no other grounds than the PLA tends to name its warships after cities, and thus the biggest ships in the line would be named after the biggest metropolises; plus there is the happy coincidence of four municipalities and a planned fleet of four carriers. And while we are crawling along this thin branch, we’ll plump for Tianjin as it is closest to Dalian. One other point to make is that, once in service, as a “ski-jump” not “catapult” carrier, it will not be able to launch the most advanced fighters. It will most likely carry helicopters and VTOL aircraft. As such it falls into the class of light aircraft carriers. It is half the size of America’s smallest carrier, as much an aviation-capable patrol ship as anything. And it is primarily intended for the PLA to learn the ropes of carrier operations. But every carrier fleet has to start somewhere. China’s defense ministry has posted to its website for the first time pictures of its worst-kept military secret, the country’s first aircraft carrier (above), a refitted 1980s-era former Soviet carrier, the 58,500-ton Varyag, that China bought in 1998. The ministry has also talked about the vessel in public for the first time, though its spokesman didn’t add anything to what was already known. The vessel remains unrenamed and no date was given for the start of full sea trials. These, though, are expected to start imminently as the carrier is due to be brought into service next year, the year that China’s first batch of naval carrier pilots will graduate from the PLA’s Dalian Naval Academy. Online video of the carrier sailing under its own power in waters off Dalian, where the fitting out is being done, was posted back in January. The spokesman also confirmed that the carrier was to be used for research and training, as has always been taken to be the case. As we noted last year, coming along behind are two 50,000-60,000-ton conventionally powered indigenous carriers being built in Shanghai with the first planned for launch in 2014. A nuclear powered carrier is scheduled to be launched by 2020. They will be warships of the line. The pictures the ministry has posted are undated. There are four more here. 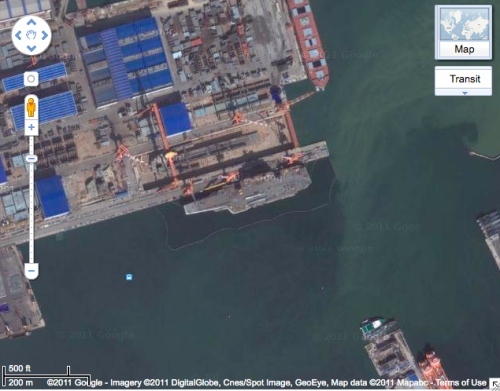 The Google map below, also undated beyond this year, shows the vessel in the water in Dalian. General Chen Bingde, the PLA’s chief of staff, is due in Washington on May 15th for a week-long visit to his U.S. military counterparts. Admiral Mike Mullen, chairman of the U.S. Joint Chiefs of Staff, is his host. It may prove to be the most significant bilateral exchange of the year. For all the progress made by Beijing and Washington in managing their differences on economic and strategic issues through regular and frequent discussions, the military relationship has remained distant and suspicious. General Chen’s is the first visit to Washington by a chief of staff since 2004. Since then the PLA has made vast strides in its modernization program, particularly of its air and naval forces, to the consternation of both Washington and its regional neighbors. U.S. arms sales to Taiwan are another sharp point of conflict. Taiwan’s president Ma Yong-jeou has just called on the U.S. to sell it F-16 fighters, which are not part of the $6.4 billion weapons deal the U.S. agreed with Taiwan in January last year, a deal that sparked another rupture in Sino-American military relations when it was announced. A determined effort is being made by both sides to bring the military dialogue into the mainstream of the bilateral relationship. Military officials were included for the first time in the Strategic and Economic Dialogue meeting held in Washington at the start of this week. Our man in Washington says that U.S. officials saw that as an opportunity to expose PLA leaders to aspects of Beijing’s civilian international agenda they haven’t much concerned themselves with as much as to get to know American counterparts. American officials were alarmed earlier this year that President Hu Jintao was apparently unaware of PLA test flights of its prototype stealth fighter during a visit to China by U.S. defense secretary Robert Gates. General Chen is bringing a high-level team with him. His 24-member party includes eight other senior PLA officers. Their agenda will include U.S. arms sales to Taiwan, U.S. military reconnaissance within 200 miles of China’s coast, which Beijing claims, but the rest of the world does not recognize, as China’s exclusive economic zone, and U.S. restrictions on joint exercises between the two countries’ armed forces and exports of American technology to China. Beijing wants an end to all of the above. Cyberwarfare, space (Chen commanded China’s manned space flight program at one point), nuclear issues and anti-terrorism and anti-piracy operations are also likely to be discussed. State media have talked formulaically of Chen looking for “new” military relations based on “mutual respect and reciprocal beneficial cooperation”. Even distilling guidelines for what that means would be a start, given Washington is not likely to agree to any of Chen’s three main demands to stop arms sales to Taiwan, maritime reconnaissance in the western Pacific or limits on high-tech exports, the sort of respect Beijing is looking for. There may be some clues from a speech General Chen is due to give at the U.S.’s National Defense University during his visit. We expect no very great initial progress, but at least the visit–and a raft of lower level ones happening this year–will get a very necessary process underway. Footage has appeared on the internet said to be the disused aircraft carrier hull China bought from Russia in 1998 and has been fitting out in Dalian. Work on the 58,500-ton Varyag appears to have been progressing rapidly. In the second half of the clip (via YouKu or, below, via YouTube), which changes from color to grainy black and white, the vessel is seen under power and taking an aircraft landing on its deck. Due to come into service next year, the Varyag is being turned into a training carrier for the crews that will man China’s fleet of indigenous carriers now being built.